I'm back with another black and white card....guess this is a very popular combo this spring. 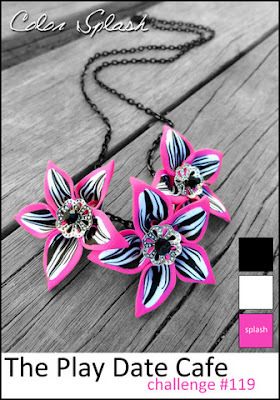 The challenge at Play Date Cafe is black and white with a SPLASH of HOT PINK. What a fun color combo! I tried to keep my SPLASH to a minimal amount. To create the background I started with black CS, then used white embossing powder on the Versamark stamped image. The stamp is from Hero Arts. The felt flower was made with dies from Sizzix and PTI. The felt zig zag is also from a PTI die. The pearl brad is from Eyelet Outlet and the edge border punch is from Martha Stewart. This is the lovely inspirational photo that was used to design my card. More beautiful work, Marie...your card is gorgeous! 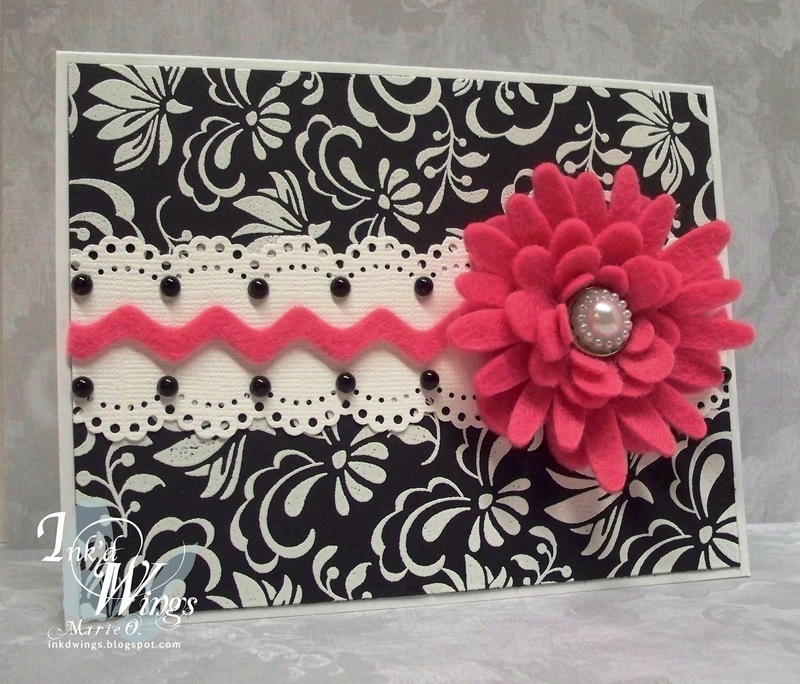 Beautiful card Marie, I love the lacy border punch, and the beautiful paper, a great colour combo this week! I must get cracking on mine! Sooo beautiful!! I was admiring the bg paper and then read that you embossed to make it. It's gorgeous!! So beautiful!! Love the pink felt flower. Great job on the inspiration. I think you have the perfect splash here Marie! Very pretty card. Stunning!!! Love how elegant this is! Oh, Marie!! First of all, it's great to see you at The Play DAte CAfe. And secondly - WOW! That card is a phenomenal way to do the color splash. Thanks for playing with us this week! Take care! Oh my goodness! This is GORGEOUS! Your take on our pink "splash" is perfect. Thanks so much for joining us this week in the Cafe! Stunning. That is my favorite color to add to black and white. This is so modern and fun!